Air humidity is the presence of water vapor in the air and water content of the environment. All insects need proper humidity to survive. Some species need extremely dry circumstances to survive, while most tropical insects need moist environments to survive. Humidity problems are the number one cause of death for many pet insects! Be sure to read the caresheet of the insect of your choice, to be able to properly adjust the humidity in the terrarium to the needs of your pet. 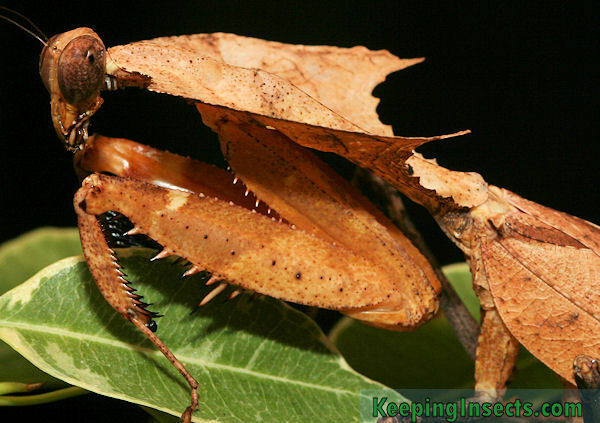 Check out our praying mantis species list or our stick insect species list. 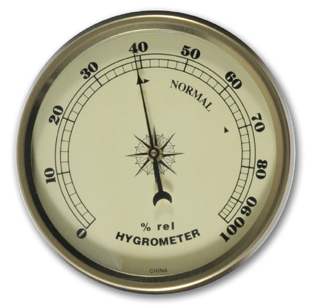 Air humidity can be measured using a hygrometer. This is a little device similar to a thermometer which displays the air humidity on a scale from 0% to 100% air humidity. This is relative air humidity, or RH. Relative humidity takes into account that air and water vapor expand when temperatures increase. 0% humidity means there is no water in the air, 100% humidity means the air is saturated with water. Most insect species that need a humid environment need around 80% relative air humidity. The humidity in houses is usually around 40 to 60%. Species that have not too stringent requirements for air humidity do well with 60% RH. The humidity in an enclosure can be higher than the overall humidity in the surroundings, creating a micro climate for your pet. The humidity in an enclosure can be increased by spraying water into the enclosure, adding living plants in the enclosure, adding a better substrate to the bottom of the terrarium, making sure the substrate terrarium is moist or by reducing the evaporation of water from the enclosure to the outside environment. The latter is most easily achieved by reducing the amount of ventilation by blocking ventilation holes (mesh or gauze) or choosing a different enclosure alltogether. The humidity in an enclosure can be decreased by spraying with less water or spraying less often and by increasing the ventilation of the enclosure by adding more holes for air to pass through. Increasing the temperature of the terrarium when proper ventilation is already installed will also speed up the drying of the terrarium. It can be hard to keep the enclosure dryer than the surrounding room. Heating the enclosure with lamps can aid in this process. This Dead Leaf Mantis needs a fairly humid environment. Almost all insects will also need drinking water. Never provide this in a dish, bowl or other container. That is guaranteed death trap. Insects drink water from droplets. In nature this is provided by rain or by dew, when you keep insects as pets you need to provide it by spraying water. You can get a very easy and cheap bottle this spray nuzzle and just spray a bit of water into the enclosure onto the survaces. Not directly on to the insects if you can help it. Insects that will readily drink water are: praying mantis, stick insect, ants, locusts and crickets. Less eager drinkers or non-drinkers are caterpillars, butterflies, moths, beetles and snails. They usually get all their necessary water from their food. Some insect species need a lot of water to drink, others need much less. Check out what your species needs before you start spraying. Both too much humidity and too few humidity is deadly. A praying mantis species from the dessert has very different needs than a praying mantis species from a tropical rain forest.